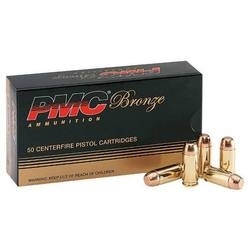 The same quality and dependability built into PMC's Starfire ammunition is incorporated throughout their extensive line of PMC training ammunition. This .38 Special 158 Grain Lead Round Nose ammunition is loaded in brand new, reloadable brass cases with non corrosive primers. All PMC cartridges must pass through the rigorous inspection of our electronic powder check station. This station accurately measures the propellant charge in each round. If the propellant in any cartridge varies by a tiny amount - just two tenths of one grain - the system stops and that cartridge is discarded. No other ammunition manufacturer can truthfully assure you greater uniformity and reliability than PMC!